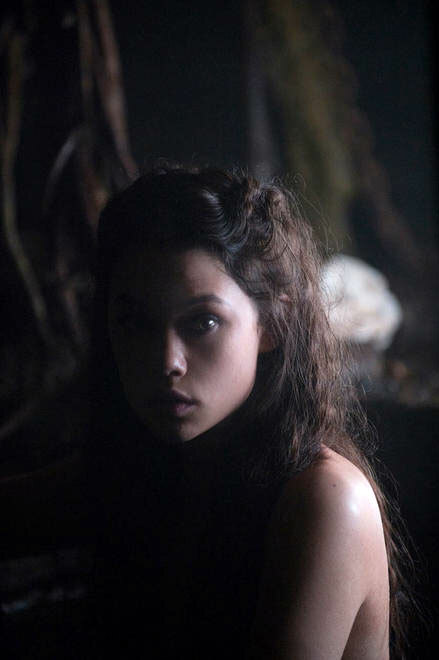 Is Astrid Berges-Frisbey Really a Selkie in ‘Pirates of the Caribbean: On Stranger Tides’? Disney has released a few photos of French starlet Astrid Berges-Frisbey as mermaid Syrena from their upcoming tent-pole release Pirates of the Caribbean: On Stranger Tides. One particularly interesting pic shows Syrena as having legs, suggesting that she may actually be a selkie (unlike mermaids, selkies can shed their tails at will and grow legs to walk among humans). Frisbey makes her American feature film debut in the Rob Marshall (Chicago) directed sequel that finds Capt. Jack Sparrow searching for the Fountain of Youth. She, along with model-turned-actress Gemma Ward, were chosen to play the film’s sirens after casting agents got wind of their natural breasts talents. Pirates of the Caribbean: On Stranger Tides stars Johnny Depp (Jack Sparrow), Geoffrey Rush (Capt. Barbossa), Keith Richards (Capt. Teague), and new faces Ian McShane (Blackbeard) and Penelope Cruz (Blackbeard’s daughter). The film cruises into theaters on May 20.